Supermodel (the exhibition) is a series of small assemblage sculptures constructed from found plastics, alongside abstract paintings, which are interpretations of these sculptures or 'supermodels'. 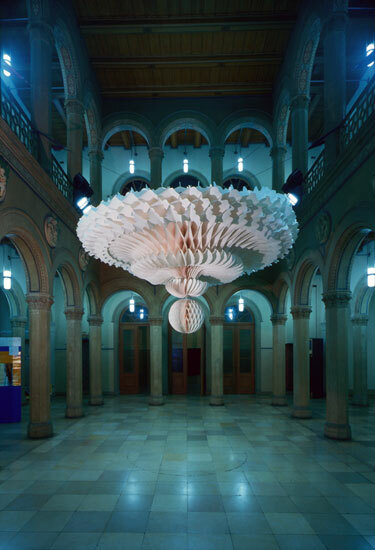 The exhibition Lustgarten was a series of large-scale ‘honey-comb’ paper sculptures, produced during a one-year Australia Council Fellowship at the Künstlerhaus Bethanien, Berlin, Germany. 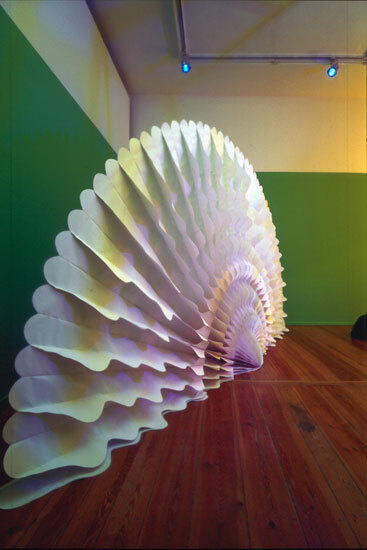 In the late 90's I became fascinated by various types of collapsible forms - objects that could magically transform from a flat shape into a 3-dimensional form. 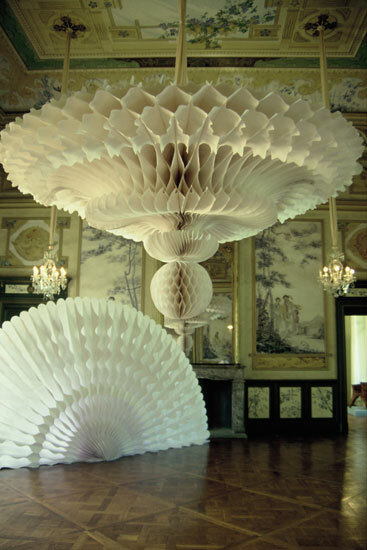 This led me to study various systems of collapsibility, which eventually led to 'honeycomb' paper decorations. 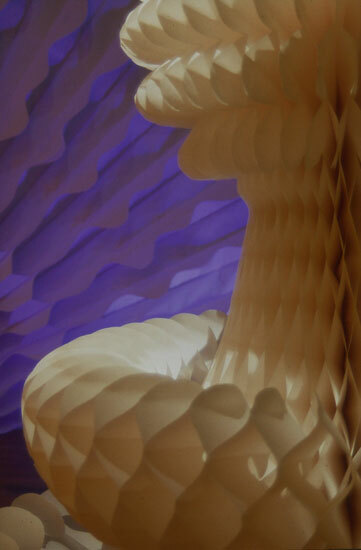 In Berlin, I embarked upon a project that involved the design and construction of a number of large-scale sculptural works based on the 'honey-comb' principle (simply put - a system of alternating lines of glue on many leaves of paper that once cut into a shape and pulled around a 360 degree axis form a voluminous object). Through trial and error, I perfected the technique and produced a mixture of freestanding and hanging objects that, with careful positioning created a tension against one another. 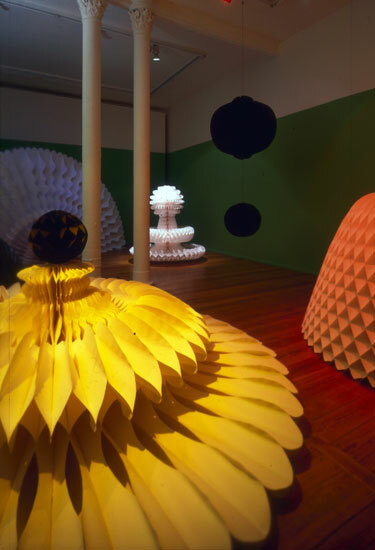 Lustgarten was first shown at Künstlerhaus Bethanien, Berlin in 2000, then subsequently at Schloss Pillinitz, Dresden (2000), Australian Centre for Contemporary Art, Melbourne (2001), Artspace, Sydney (2001), and CAST, Hobart (2002). 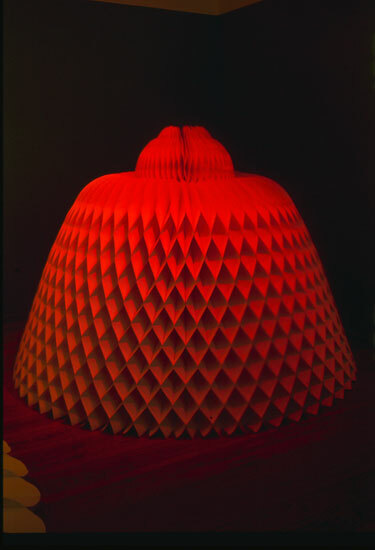 In subsequent years, several honey-comb paper sculptures were commissioned for the following: the stage production ‘Carmen Miranda Revue Pavillon’, Director - Holgar Freidrich, Haus der Berliner Festspiele, Berlin (2001); the concourse area of The Esplanade Arts Complex, Singapore (2003); a promotional event, Hermes Australia, Centennial Park, Sydney (2006); and the Moet & Chandon Spring Carnival Tent, Melbourne Cup (2006). “In his blue gardens men and girls came and went like moths among the whisperings and the champagne and the stars … And on Mondays eight servants, including an extra gardener, toiled all day… repairing the ravages of the night before … at least once a fortnight a corps of caterers came down with several hundred feet of canvas and enough coloured lights to make a Christmas tree of Gatsby’s enormous garden.” F. Scott Fitzgerald, The Great Gatsby Balls and other Festivities. Social occasions divide up years, and all of them have their attendant forms and rituals. The festive decorations which accompany many seem specifically designed to remind you of every other similar occasion that you have ever endured. They are imbued with an invitation to mentally wander down a potentially tortuous nostalgic path. They dress a room – if only scantily, elevate it out of the nasty humdrum, and give what goes on beneath them the status of the ought-to-be memorable. Whether it is a bunch of hurriedly blown-up balloons or ice sculptured swans in a rented marquee, the material principle and the message is the same. To live for a special moment is to be surrounded by light, fragile luminous things that have nothing to do with being built to last. 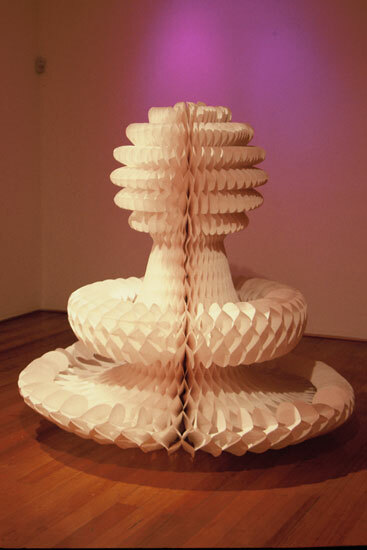 The multifarious sculptures of Louise Paramor often appear to be celebrating something (even if it is an occasion only known to themselves) or as if they have been brought into being for a celebration. You could be forgiven for happening upon them in a gallery or installed in a foyer and wondering – is it all over or am I just too early? 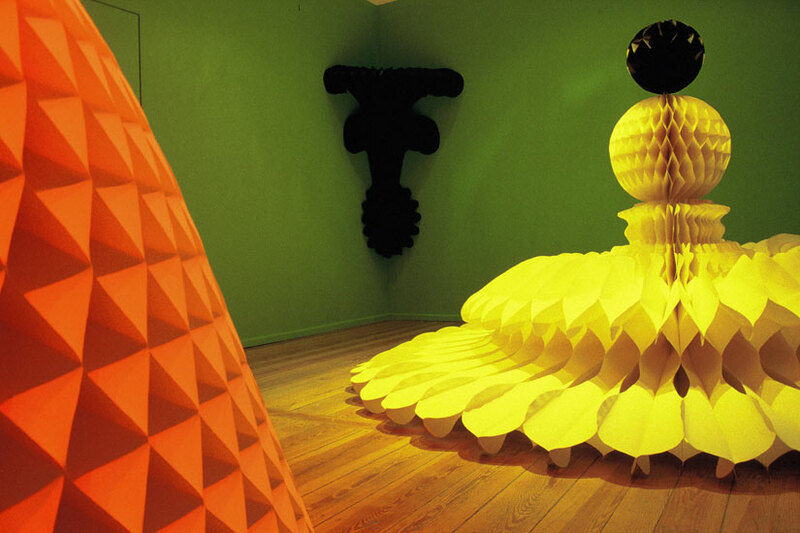 The sculptures for Lustgarten (2000) – her exhibition at Künstlerhaus Bethanien, Berlin – evoke the playful suggestion that the celebration (a garden party?) is alas only in someone’s head. Here is the moment in which bedfellows: excited anticipation and bitter disappointment are indistinguishably bound together. It’s almost as if the principally black clad art audiences are intentionally put in the position of being gatecrashers, undesired guests at something to which they were not really invited. You’re a distant friend of a friend of a friend. 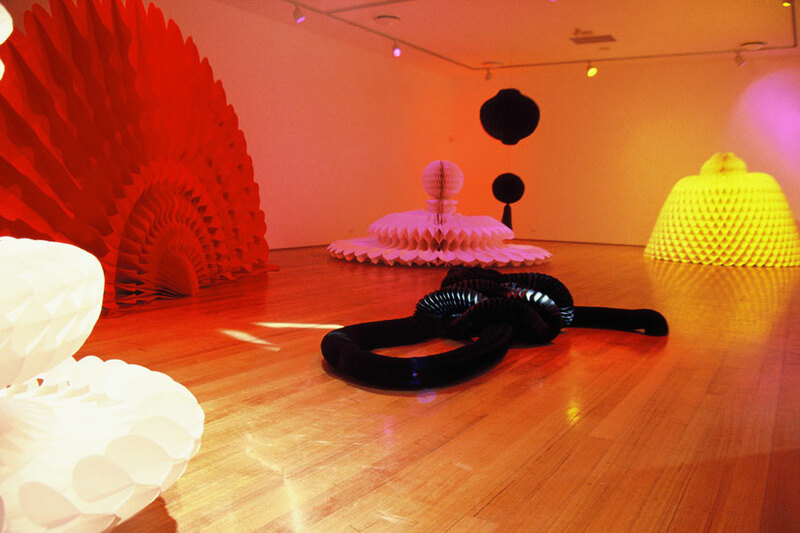 In the 1990’s artists realised again that creating ambient rooms and party atmospheres could be art. 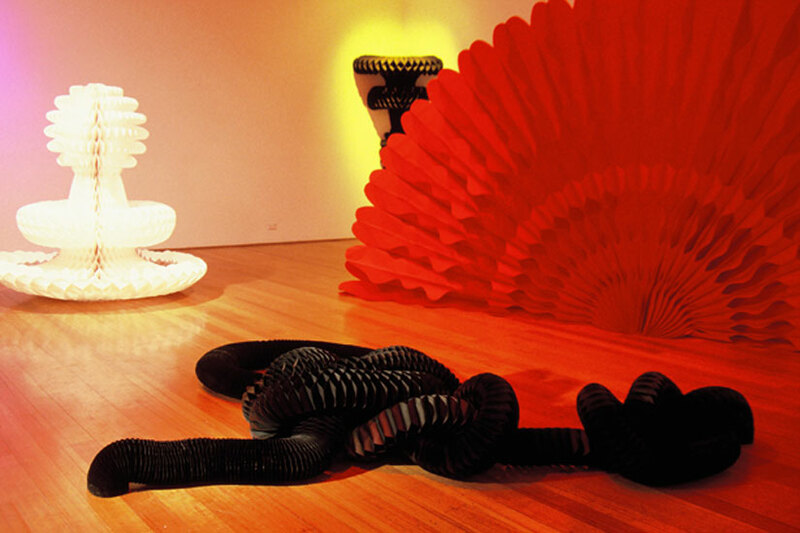 Paramor, however, has remained dedicated to the production of sculpture. Over the last decade she has been increasingly drawn to lightweight, comparatively inexpensive ubiquitous ephemeral materials like paper, cellophane, wire, old glass, foil – an artist’s residency in India cemented this predilection. She is clearly infatuated with valueless stuff and transporting into the ultimate field of value judgments. And to things that can be transformed by bright or clever light or by being suitably situated. Hers are strange awkward works that often emerge only at the last minute from a monotonous risky and laborious creation process. The most recent sculptures with their illusion to decorations in both form and material perhaps address our desire for physical permanence in art and respond – that desire is a folly, everything is mutable. 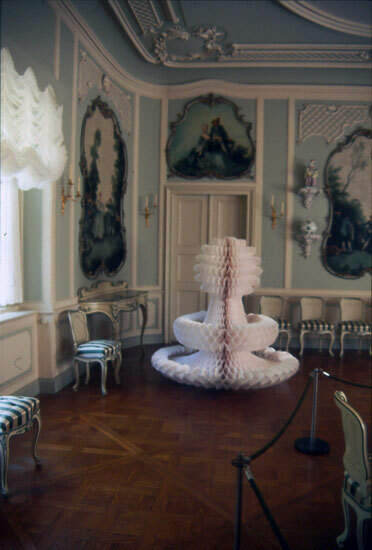 The sculptures for Lustgarten are exaggerated, large white and black paper decorations of obscure design origins – with an oriental touch here and a “baroque” like curve and curl there. 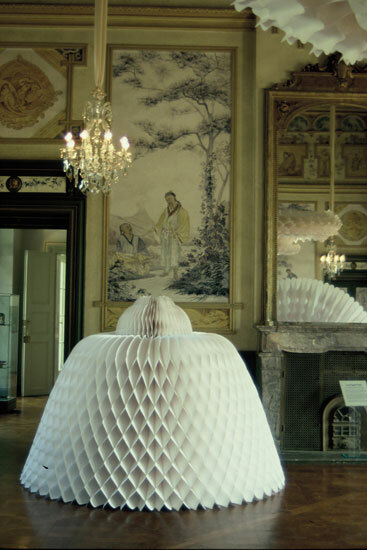 These bulbous waifs are the product of the artist’s ferreting around for examples of a particular kind of decorative technique – honeycomb paper. She then adapts and alters the design of the machine cut miniature originals – her maquettes. For instance with one, a bridal party silhouette which arched over everything was righty omitted. 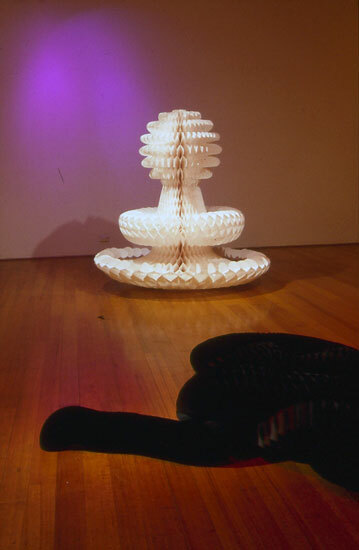 She first applied the technique for a community arts project collaboration. 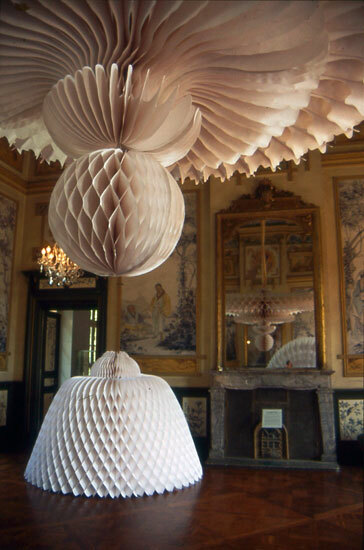 Later she perfected it for Lunarcake (1998) and Pink Fit (1998) – a charmingly over-the-top hanging sculpture which evokes at once associations with both decorative chinoiserie and geometric abstraction without, and quite coquettishly, privileging either. The new sculptures stand and hang as if conscious of their own eccentric appearance in a field of green. The room is divided by a scallop edged paper fan, that socially decisive and potentially divisive instrument, especially when I the hands of a paramour. It is scaled so that it can not only shield the face from unwanted admirers but rather your whole costumed body. 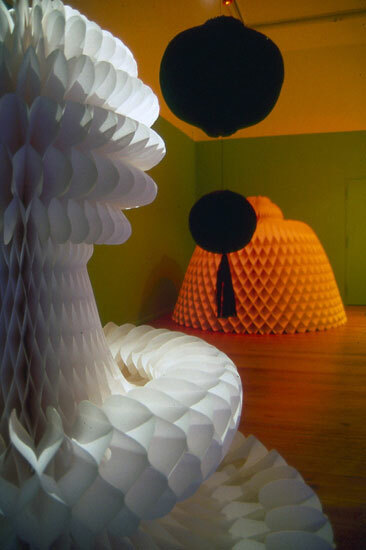 Elsewhere two jet black quince shaped pompoms hang like planets in a fixed orbit. 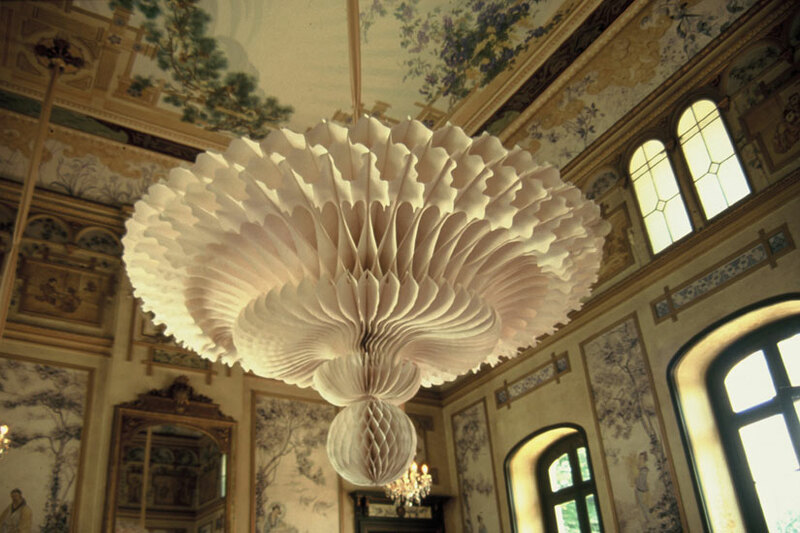 Everywhere intriguing delicate forms like millefeuille pastries, constructed of at least a hundred glued layers of paper, open in the room like alien blooms. This sculptural scene, an artificial garden of sorts, is lit by jel covered spots. It is a pretty and shamelessly theatrical sculptural situation, which employs the traits that Michael Fried described in his objection to some minimal art of the time for being ‘theatrical’. The works have presence and operate like a confrontation with a silent person over a period of time. The inflection that Fried then gave the word “theatrical” by attaching the verbs “corrupted and perverted” reminds me somewhat of much earlier modernist attacks on ornament, embellishment and decoration. 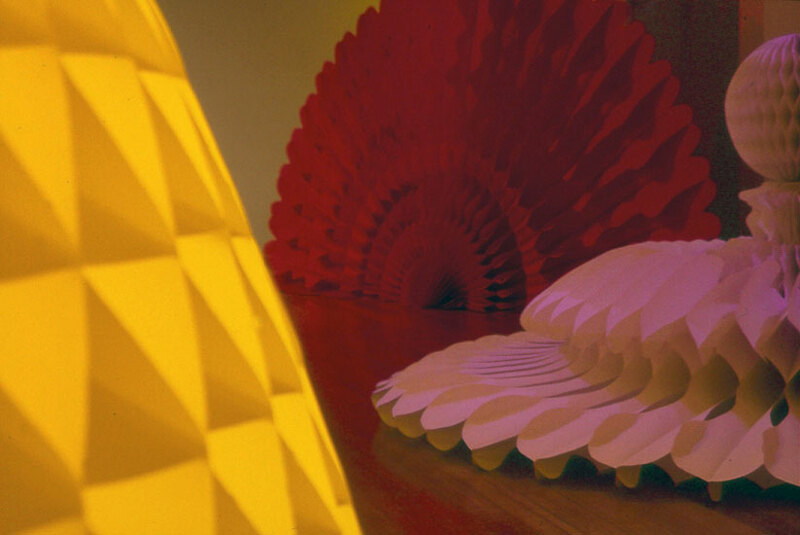 Louise Paramor’s new sculptures are, apart from being theatrical, also literally and unabashedly decorative. 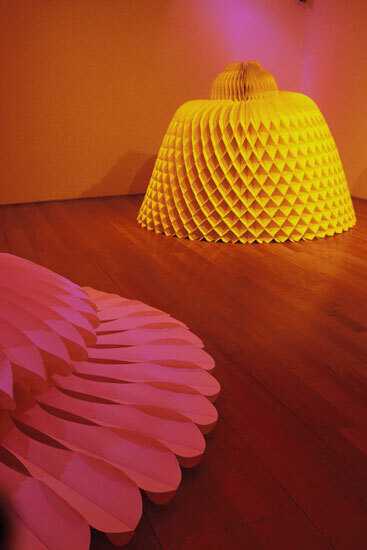 It comes as no surprise that reception of her first solo show with this kind of work at William Mora Galleries, Melbourne – 1964 (1996) – met with the banal objection – but this is just decoration. Such an objection has a modernist history – ornament and decoration being seen as antithetical to good form, a kind of masquerade, or like an over-dressed woman. 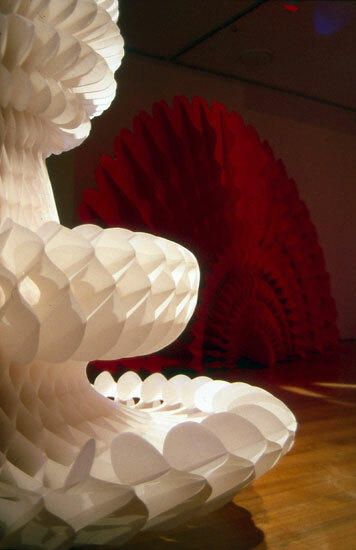 Seen in this light, Paramor’s sculptural synthesis of florid and floral forms, colour lit white surfaces and sensuality are a form of feministic retort to an ingrained prejudice. The foyer of Bethanien is a neo-romanesque column and arch affair with semi-restored paintwork. Here Paramor hung a broad white expanse of honeycomb paper that recalls a chandelier. There is gentle irony that the work suggests something much more festive than the surrounding rather morbid interior – ghosts and all – of one of Berlin’s first modern hospitals (circa 1845) which is now a visual arts and cultural centre. 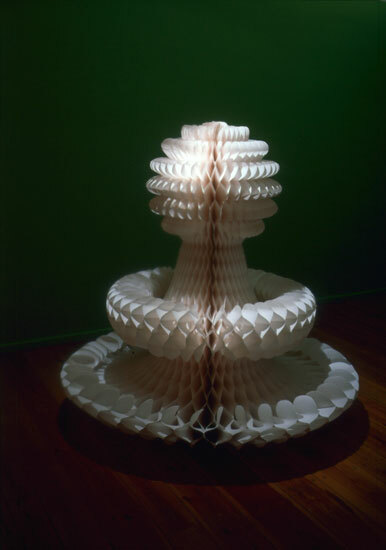 In 1997 for a group exhibition World Without End in St Patrick’s Cathedral Melbourne the artist installed a sparkling concertina or fold-out chandelier made from heavy gauge aluminium foil. The exhibition first conceived of by Jock Clutterbuck was then carried out by Rosemary Crumlin RSM (included here in order to give credit where credit is due, but also for the ring of the names). The latter is a catholic nun who was concerned to enquire: is the divorce between church and art final? 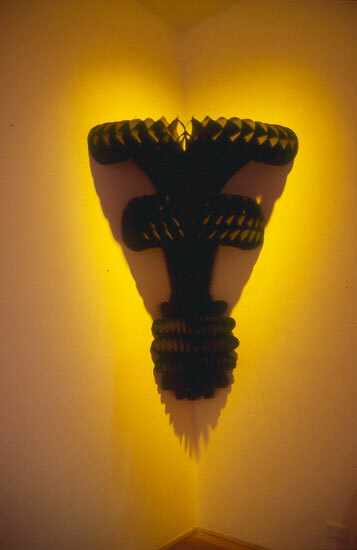 Chandelier (1997) was also shown as part of primavera (1998) in the foyer of Sydney’s museum of Contemporary Art. Both works are like garden follies, eye-catching incidents, formal occasions but rather at odds – in a demonstratively flirtatious way – with their institutional settings, whether cathedral, museum, hospital or visual art venue. The Lustgarten – a pleasure garden, an attractive garden designed for conversation and strolling – predates the European invasion of the artist’s birthplace, Australia. There the Lustgarten’s distant relative, the public park, developed principally in accordance with English developments as the pressures of the industrial revolution and teeming urban centres necessitated that designated green areas be opened for the general populace. It is a particular feature of the Australian situation as a colony that the transplanting of social norms, laws, architecture, art etc. resulted in bizarre clashes and incongruities (not to mention genocide). In a way the aesthetic history of Australia, the wealthy colony – is the story of crazed and ambitious importing of cultural products (in return for primary resources), opening the crates and then dealing with the resultant mess. 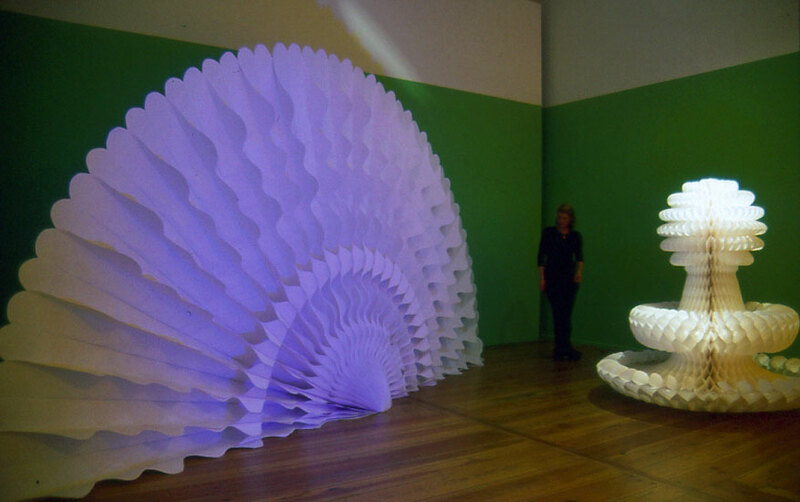 Paramor’s works are full of such style clashes and an approach to materials and referential sources which has aspects of the Australian condition. Although her works form definite quirky wholes, they appear far from self-evident or self-contained. They are nearly always large ungainly or flimsy unlikely things for example: Phantom Valley (1997) - a red cellophane mountain with blue buds on it or Bala (1996) – paper drums srung like beads on a necklace hanging on a wall, or Big Mouth (1993) – a kind of gaping floor mirror that has opportunity shop glasses for teeth. The new sculpture too has the same quality of estrangement from a variety of cultural sources, source which have under gone a process of displacement and hybridisation. Semi-detached, temporarily detained, self-supporting and capable of collapsing. Lustgarten was reviewed in the following newspapers: Der Tagesspiegel; Dresdener Neueste Nachrichten; and The Australian. It was covered on ZDF (German National TV), ‘Hot Spot Berlin-Künstler aus aller Welt an der Spree’, and ‘The Arts Show’, Artist profile, ABC TV (Australian National TV). Lustgarten (Schloss Pillinitz, Dresden) was featured on the cover of Art&Australia magazine, with an article by Eve Sullivan ‘The Love Artist’ (September 2002). Two pieces ofLustgarten (black hanging form and red fan form) are owned by The National Gallery of Victoria. One piece of Lustgarten (black snake form) is owned by Monash University, Melbourne.